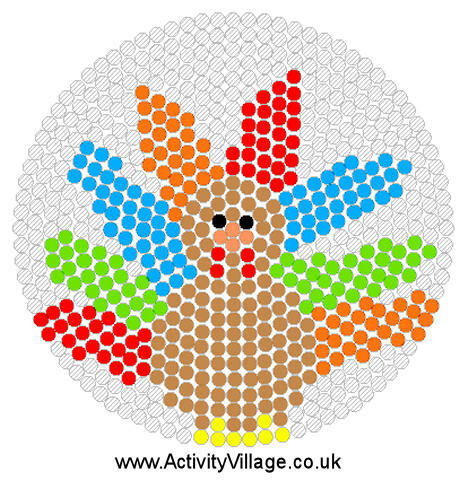 We used a large circular peg board for this Turkey fuse bead design. The main body is made with light brown beads, and we have chosen bright colours (green, blue, red and orange) to make the turkey's feathers. Yellow beads are used for the claws, and we have drawn in the turkey's features with black, pink and red. The turkey makes a cute badge or "pin" or table decoration, and looks great in a Thanksgiving mobile, too. Practise pencil control and early counting skills by following the numbers 1-10 to draw the body on our turkey dot to dot. Then get out the crayons and colour the turkey.